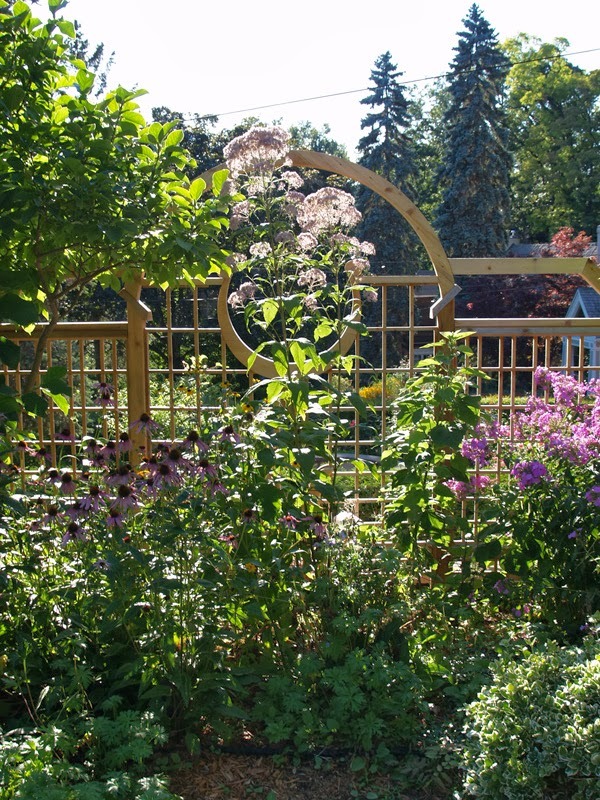 Learn to Build Trelliswork and Trellis Fences the Right Way! A Beautiful Trelliswork Fail – What not to do! How not to design a trelliswork privacy screen. 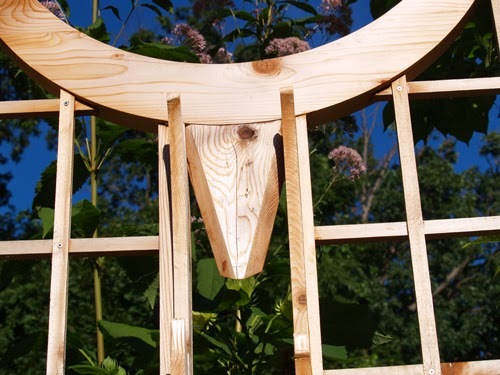 This trellis is intriguing, artistic and looks to be a fine addition to the home. Trouble is, I was the designer on this project and unknown to me this “Contractor” talked the client out of what I had designed and into his masterpiece of creativity. This project was built a few years ago. I stumbled on the photos and thought they may serve as a good way to illustrate some guidelines for building trelliswork. We should learn from others mistakes when possible–it is cheaper! 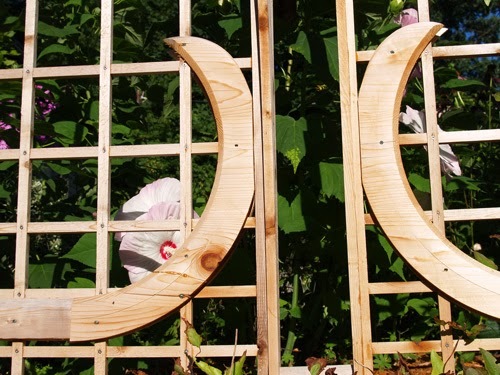 Let me make this clear; I photographed this trellis-work panel, but this is not my design. Dave was only around for a few months and he was incapable of following anyone’s designs but his own. I am all for understudies suggesting improvements, though I would prefer to be kept in the loop, mostly to prevent disaster. I tried hard to impart the most basic structural logic to this kindly giant of a man, but he knew better. He didn’t mention any changes to me at all. I discovered this monstrosity as I drove by a few weeks later. Curves need to go with the grain in one direction, or for a semi-circular curve you could use marine ply, or Crezone, or better still, make the curve from multiple layers lapped over each other and fastened with waterproof adhesives. The glue you can see above is called Gorilla Glue, and it is not waterproof adhesive. 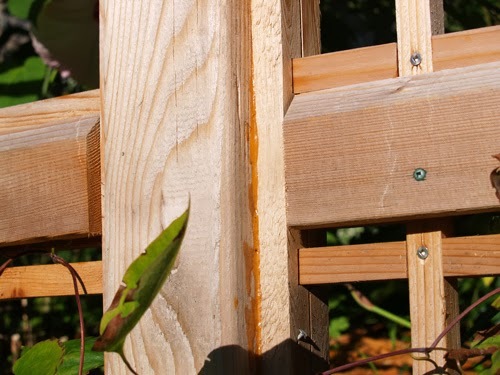 Screws are not the right fasteners for small pieces of wood outside. They cause cracks and rot. You can see nearly everywhere he screwed the pieces of half lap lattice together they cracked. If he had used 15 gauge finish nails, the results would have been far better. Fewer cracks mean less opportunity for moisture to get in. Half lap joints in latticeworks poorly in the elements. Every connection has end grains exposed–which soak up moisture and cause premature rot. Better to leave the lattice full width and just fasten to each other. We normally recommend pre-finishing the parts to prevent rot. Fit and finish is lacking, which is likely due to budget and lack of experience. These large artistic curved parts should be made as 1 part, rather than scabbed together pieces that are prone to rot. The lattice seems to be tacked to the curved parts, which just won’t last. Many of the connections seem cobbled together, rather than each adding to the integral strength of the panel. Anyone can build something by scabbing a layer of wood upon layer of wood. It takes a master to create something simple, stylish and structurally superior. All these scabbed together parts will soak up moisture and lead to early failure. The underlying lesson here has to do with the function of a designer. I could have designed something ornate for this client–however, that didn’t suit the client’s budget or desires. She couldn’t afford to have something done with this look and pay to have it done properly. 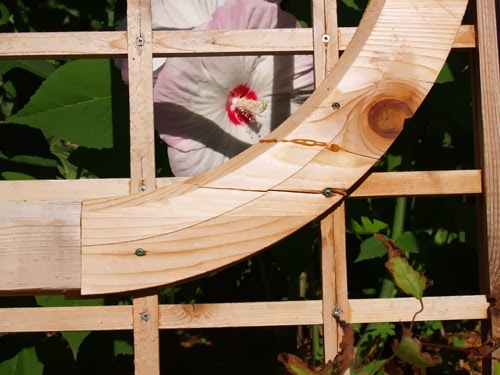 I designed a fairly simple trelliswork screen that was pre-finished so that she wouldn’t have to be staining it every year and repairing it forever. It comes down to whether the client will be happy 5 years after the project is built. It is the same for decks, fences, and pergolas. A professional designer matches the scope and details to the client’s desires and budget. We tradesmen need to respect the designer–and stay true to their design. I will have to drop into this home this spring and have a look at whats left–maybe we can add another photo to this article later. In Search of Quality — 2015 a very good year!